I really enjoy participating in the Daring Bakers because A) I get to try out recipes that I might not normally be drawn to and B) my skills as a home cook are challenged. Some challenges are easy for me, and others make me want to run and hide. 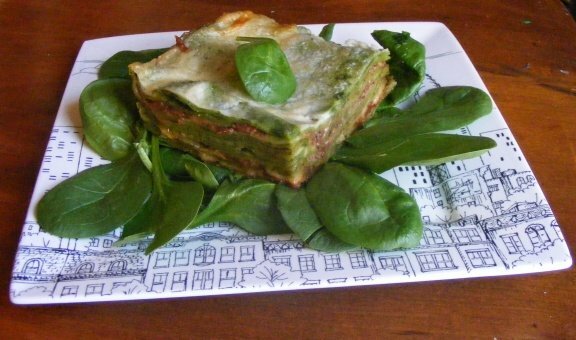 I must admit that this month’s challenge — which asked DBers to make pasta from scratch, and create a lasagna using bechamel — was a run-and-hide challenge. Why? One: I’m picky about lasagna. Two: I don’t have a pasta machine, so rolling out the lasagna would have to be done by hand. Three: I’m not a bechamel fan. Let me say right here (in case anyone was experiencing recipe related suspense!) that I am so glad to have participated this month. The resulting lasagna was fabulous. Yes, crafting pasta from scratch without a pasta machine was intimidating. But the dough was beautiful, and surprisingly easy to work with! (And, um, using the dough hook on my stand mixer made bringing the dough together a breeze…) It rolled out nicely and, as long as I kept it lightly floured, did not stick to the board. Did I get it as thin as I could have? Probably not. Still, the lasagna was lovely, tender, and so much better than dried pasta. And a beautiful vivid green — perfect for the dawn of Spring! After assembling the lasagna, I had about 8 noodles left over, so I spread them with part-skim ricotta (16 oz. total) mixed with chopped fresh parsley, salt and pepper, and rolled the noodles up. I topped all this with an impromptu sauce: I sauteed 6 oz of ground sweet sausage, about two chopped onions and 3-4 cloves of chopped garlic. Then, I added the leftover canned tomatoes from the ragu, and let simmer for 5 -10 minutes to let the flavors meld. In a small casserole dish, I spread a thin layer of the sauce on the bottom, topped it with the lasagna rolls, and smothered them with the remaining sauce. Then, I baked them in a 350-degree oven for 35 minutes, topped the rolls with some shredded mozzarella, and baked for another 5 minutes before serving. Delicious! All around, this was a great challenge and a delicious recipe. Many thanks to this month’s hosts: Mary of Beans and Caviar, Melinda of Melbourne Larder and Enza of Io Da Grande. Check out all the other DB versions of the recipe at the DBers’ new home, The Daring Kitchen.